Already suffering from the abuse of time and neglect, L.B. Landry High School was shuttered after Hurricane Katrina ravaged the city on August 29, 2005, due to extensive rain and wind damage. Few expected the 70-year-old school to reopen, but Landry had deep roots in the community as the first high school in the area to accept African-American students. A dedicated cadre of alumni and community leaders rallied to save it from the wrecking ball. The existing facility, a city block of one-and two-story buildings arranged around a courtyard, was slated for demolition and replacement. 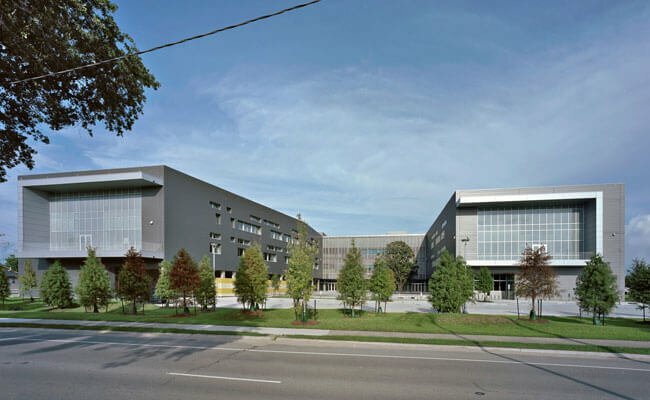 The New Orleans based Eskew + Dumez + Ripple was selected to design a new 236,000-square-foot, $55 million building for the site and was given a tight time frame of six months for design and 20 months for construction. 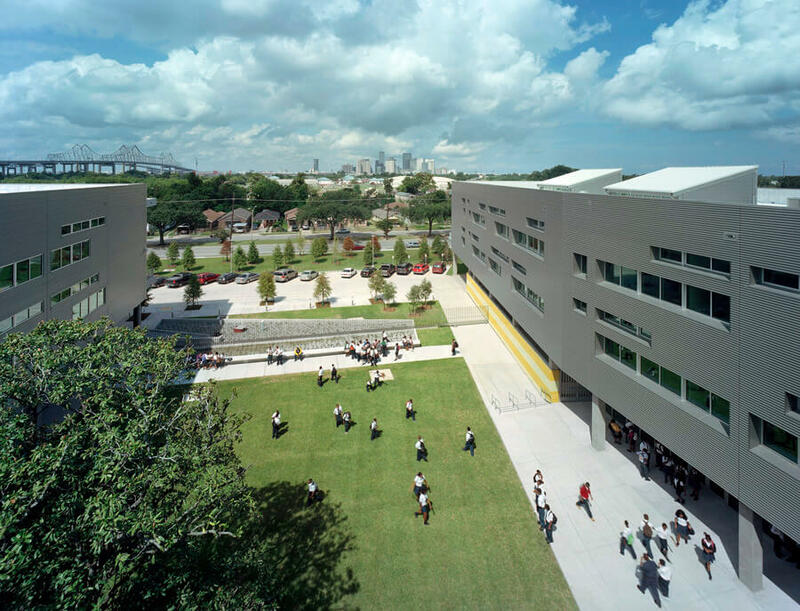 The design team created a scheme that retained the old school’s basic layout, with one notable exception – instead of enclosing a central quadrangle, they removed one wing to provide visual access into the heart of the school, as well as back out to downtown New Orleans. Constructed under stringent new hurricane-resistant standards, the concrete-and-steel framed structure is clad with Echelon Cordova Stone™ which is a pre-finished cast stone masonry unit by Oldcastle APG, A CRH Company. In addition to state-of-the-art educational facilities, vocational/technical center, and sports complexes, the newly constructed complex also houses a community health clinic. The project achieved LEED® for Schools Silver certification and was named in 2011 by Architectural Record as one of the ten featured schools in their annual “Schools of the 21st Century,” a special report highlighting the best and brightest in planning and design for K-12 education facilities. The project was also recognized by Architect magazine in their 2011 Design Review. Learn more about what solutions we offer for architects and engineers, including our extensive knowledge, experience, and industry insights.